The Trade Committee (INTA) of the European Parliament (EP) will vote on its resolution on TiSA, the Trade in Services Agreement, on 18 January at 19.00 CET. This resolution can give a strong signal to the European Commission negotiators that the EP will not ratify TiSA if it threatens the public interest. 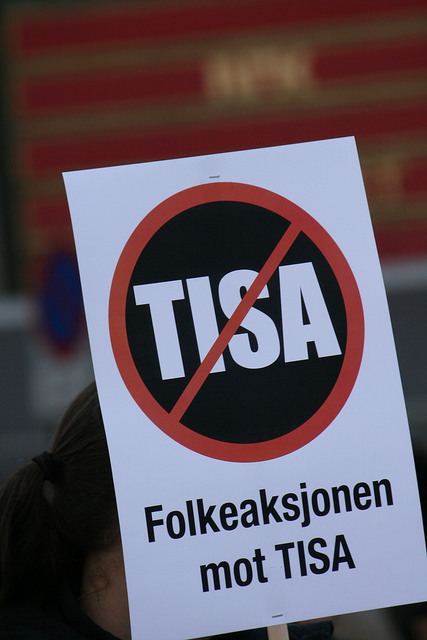 TiSA negotiations contain many controversial elements that are also concerning in the case of TTIP. Bellow is a template letter drafted by several civil society organisations, including S2B members. You can contact INTA MEPs before the vote – 18 January, 19:00 CET. Although the negotiations for a Trade in Services Agreement (TiSA) do not get as much attention as TTIP, there are similar and additional issues of concern from a public interest and civil society perspective. In contrast to TTIP, the EC has provided much less public transparency about EU proposals and positions in the TiSA negotiations. However, wikileaks have provided some good insights in the negotiation texts and EU positions, and exposed many problems. Therefore, we have serious reservations regarding the current negotiations’ direction and progress, and the proclaimed potential benefits. For instance, the TiSA draft texts and the EU initial offer reveal that the right to regulate for social and public services is legally not fully protected, and that the neutrality principle in the energy services is not supportive of the EU’s commitments against climate change. A group of civil society organisations and unions have therefore called for a moratorium on the TiSA negotiations. On the 18th January, we encourage you to vote on a TiSA draft report that gives strong signals to the EC negotiators and EU member states that some important principles cannot be negotiated away. However, in general some of the aggressive market opening principles in some of the amendments. The protection of the full right to regulate, and the protection of public interests and public services. This includes the rejection of all standstill and ratchet clauses, the protection of so-called non-tariff barriers that are necessary to protect consumers and achieve public policy objectives, and the opposition to a necessity tests or domestic regulation disciplines on measures designed to achieve public interest objectives. The prevalence of fundamental rights over free trade. For instance, labour and social standards, conventions and laws should always be applied and improved, implementation of the Sustainable Development Goals should be prioritised, and EU privacy and digital rights should be prevail over trade and investment rules. The protection to reform the financial sector, including the possibility to ban risky and speculative financial products. Transparency and accountability of the TiSA negotiations, amongst others to give access to all negotiating texts to the public, during the negotiation process. We regret the aggressive market opening principles included in many of the amendments, and urge you to oppose compromise amendments 29, 44, 50 and 62.